Nicole and Mike’s charming St. Pete Beach wedding featured a breathtaking rooftop ceremony overlooking the ocean. Sprinkled with soft and romantic hues of pink throughout, the decor was a perfect mix of elegant and classic. The Tampa bride and groom pulled out all the stops with stunning décor, a scrumptious menu, and a rocking band. 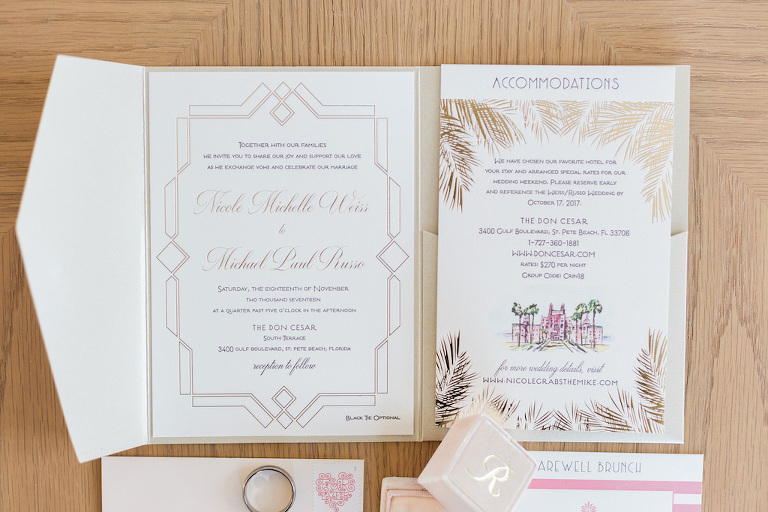 When searching for the perfect St. Pete Beach wedding venue, the bride kept in mind what was most important: beautiful views and an all-star team to make the day perfect. Live entertainment was a must-have for the bride and groom, and they selected a wedding band that they can’t wait to hire again. Once the bigger puzzle pieces started fitting together, things such as inspiration for the wedding invitations came easy. 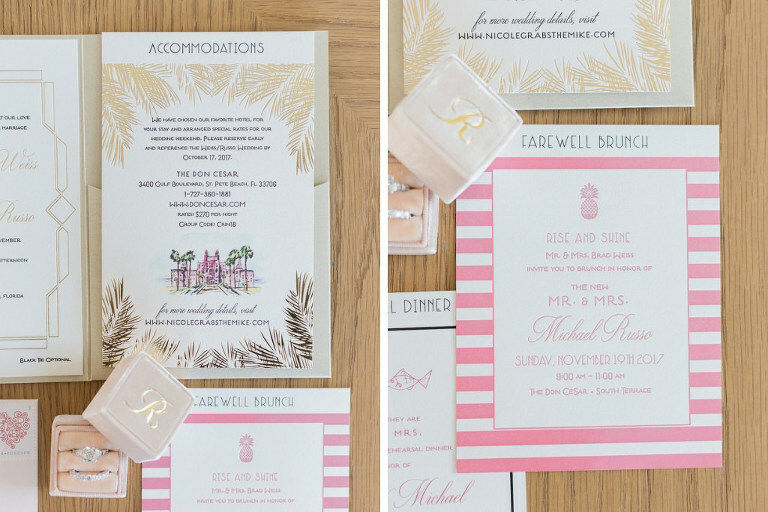 Creating a first impression for their guests, Nicole and Mike chose St. Pete wedding invitation company A&P Designs. Looking back, Nicole shared that she will never forget the first glimpses of their perfectly put together day. “Our first look of each other and of the reception room was one of our most memorable moments,” the bride reminisced. 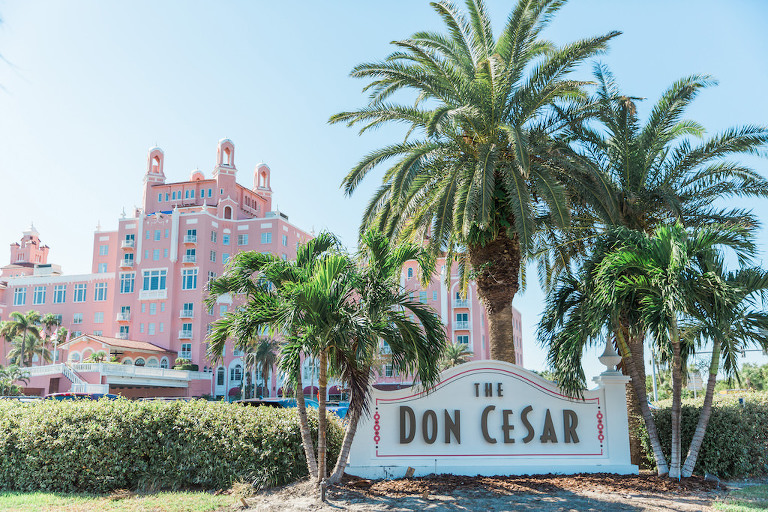 Art deco, and the Don Cesar. I loved that A&P Designs were local and were accommodating to every vision we had to make our wedding paper perfect. On the beach but no sand, therefore, we got married on the terrace on the rooftop of the Don CeSar. The location stood out to us, and it was inclusive of all the services. They are top notch in customer service and making our day amazing! What was a spontaneous date night turned into one of the best nights of my life. Mike charted a private sailboat down the street from the Don CeSar, and as the sun was setting and the boat turned to face the Gulf, he got down on one knee and proposed. Classic and elegant, white with a pop of color. I chose every detail. 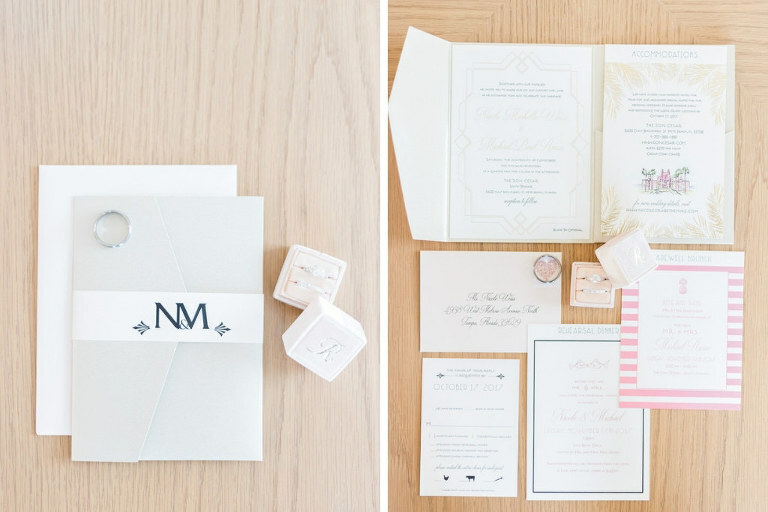 For our ceremony our colors were white and blush pink, think soft and romantic. When they left the ceremony the hallways had a pink hue that got more vibrant the closer you got to our reception room. For the reception, we went with pops of vibrant pinks and purple. The most important part – they are the key to the party. Can they engage with the audience and keep the party going? Matt Winter Band was amazing! They did a phenomenal job, and I’d hire them again for our 10-year vowel renewal. They are highly recommended! Interview multiple vendors before deciding on the right fit for you.